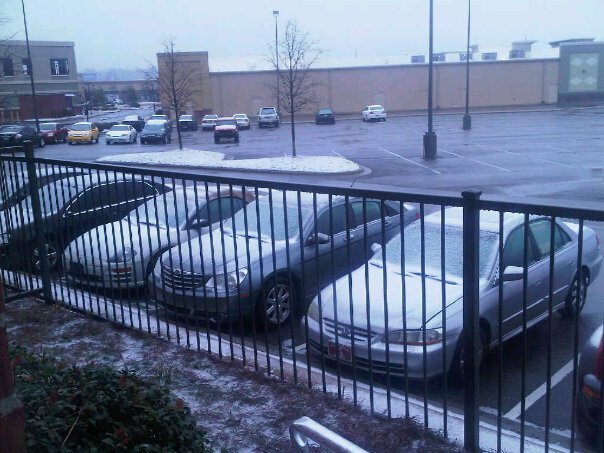 So after a freezing winter break in Michigan and Wisconsin, I get back to Tuscaloosa, Alabama not to find sun and warmer temperatures, but to a "winter storm warning" for all of northern Alabama, which includes a wintry mix and potentially 2-6 inches of snow accumulating over the next 24 hours. The University of Alabama (undergrad) has already moved the start of their spring semester from tomorrow to Wednesday (unfortunately, the law school has yet to follow suit -- they've only canceled classes that start before 10 AM), and everyone is going to the nearest Target or Publix to stock up on canned food and bottled water in the event of a power outage or the end of the world. My dad called me earlier yesterday regarding the storm -- not to tell me to drive carefully because he knows I can handle the roads, but to tell me I'd probably be one of two or three people in the state of Alabama who knew how to drive in winter weather, so to just watch out for everyone else on the road (which, while I love all of you from here, is incredibly true). I know snow is somewhat of a miracle in the south and everyone enjoys the 24 hours they get to see the ground all white and pretty. But I promise you, the grass isn't always greener (or whiter in this case) on the other side. 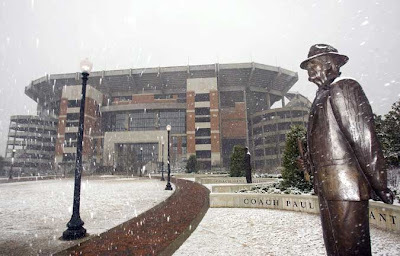 I went to school in snow basically year-round and it is a very big reason of why I moved to the south for law school. So enjoy it now, but be thankful it is not what plagues your home state for six months out of the year. On the plus side, I never had a snow day in undergrad where it snowed feet per winter, and I have at least half a snow day now that I go to school in Alabama. Karma works in mysterious ways. PS: Weather report from my boyfriend -- the roads are icy. Stay inside! UPDATE 1/10: The rest of classes were canceled for today at 10:30 this morning, after my roommate (who is from Miami) sat in her car for 15 minutes trying to figure out which button was the defrost / what she should use to scrape the ice off of her windows. That, & a little bit of ice, will get you a snow day in Alabama. ROLL TIDE.